Robin Williams, one of the funniest men alive and probably my favourite besides Rik Mayall, has died of an apparent and suspected suicide. The news was reported in the early hours of this morning, UK time, but most are just hearing about it now so he probably went last night. I was shocked by Rik Mayall and his heart-attack but for Robin Williams to go in the way he has is very shocking and very sad. I always wanted to meet both Robin and Rik to see what made them tick and as madcap as they were but now it is too late. The reaper has claimed two of the greats in quick succession. I hate the reaper at this moment in time. He takes all the good ones far too soon when there is still so much to give to the world. The tabloids and other news feeds are all being speculative on the how’s and why’s of his demise but who can really know why he did what he did except for him, unless he left a note of course? However he died, it doesn’t really matter. All that matters is that he saw this was the way out of his problems and thought no-one could help him. God, the poor man and his family that he has left behind. I can’t imagine how low you have to be to want to go through a suicide of any kind. All comedians have a form of depression they say and are tortured souls and he was always at the top of his game so to do that at the height of his popularity is shocking. I was only watching a film with him in it at the weekend where he played a nasty piece of work called August Rush. He was exceptional in it as he was in anything he did really. He was so very talented. 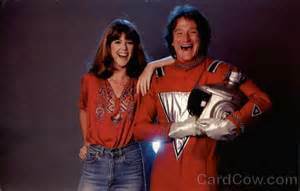 I first remember him in Mork and Mindy back in the seventies and eighties. It was probably my favourite show at the time and I thought Robin was completely mad and had never seen anything like him before. He really was an alien to my young mind back then for no human I had ever met was like him at all. After that I followed his career in film as much as I could. The next thing I saw him was was the World According to Garp, a serious role for him with a touch of his comedy genius layered in it. It was probably one of my favourite films at the time and still has a special place in my heart. 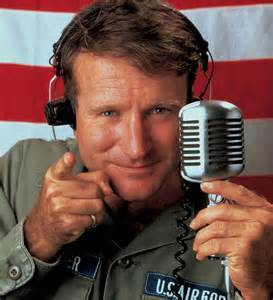 The next big film I saw him in was Good Morning Vietnam, a film loosely based on real events. The whole thing was a roller-coaster of his comedic madness. He seemed to let fly all the way through and I can imagine the director had problems reigning him in for such was his energy. I’m trying to think of a bad film he did but am struggling at the moment because even if a film was bad, he wasn’t. Mrs Doubtfire was of course brilliant as was The Adventures of Baron Munchausen (he was bonkers in this) and the Fisher King. Dead Poet’s Society was just a fantastic film and loved by many with its dark themes. I could go on with a list of films like Awakenings, Hook, Insomnia, Good Will Hunting and What Dreams May Come. He wanted to play the Riddler in the last Batman films by Christopher Nolan but Nolan said no to the character. He would have been maniacal and fantastic if he had done. I wanted to be like him so very much. It was always my intention to see him live doing stand-up someday but sadly that never happened and never will now. He was an interviewers dream and nightmare. He was a ball of fire and light in the darkness. Sadly his own darkness could not be beaten back. My lasting memories of him will be his big mischievous smile and mad laugh and his boundless fireball of energy that affected all he touched with his comedy and zest for life that sadly has now gone to the great stage in the sky. I am sure that wherever he is now he will be making many laugh hard. His kind face and soft voice seemed wise and comforting to many who watched him growing up. I can only imagine what it must have been like to be his family and friend. Robin McLaurin Williams was born in Chicago, Illinois, on July 21, 1951 to his mother Laura McLaurin, a former model from New Orleans and to his father Robert Fitzgerald Williams, a senior executive at Ford Motor Company in charge of the Midwest region. He has left behind his wife, Susan Schneider and three children, Zachary Pym Williams, Zelda Rae Williams and Cody Alan Williams. 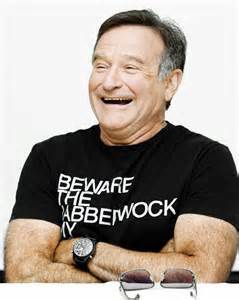 Rest in peace Robin and thank you for the laughs. I won’t forget you… Nannoo nannoo. *For those who think they are depressed or who need to talk, please do something about it and talk to someone. There are many groups out there like the Samaritans and Mind UK as well as your doctor and suchlike. CALM is a charity specializing in helping men come to terms with mental health issues. Never be alone and always ask for the right help.